An American sci-fi film where humanity and machines, who have realized their existence, collide. The goal of the robots is clear – to destroy the mother of the future leader of the human resistance against the robots. Arnold Schwarzenegger becomes the first Terminator. He might be destroyed in the first film, however, do not worry! 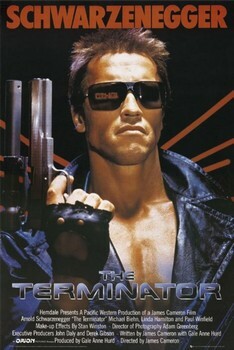 It is not possible to have Terminator film without the Terminator, so he comes back in the second series. What do we enjoy about the film the most? Great effects and then Arnie itself. He can be the one decorating the walls of your room! We have the Terminator poster for you and a poster from Genisys Terminator as well.